Sorry, there are no shows on sale at Apollo Theatre right now. 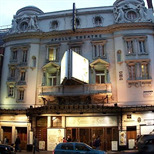 The Apollo Theatre is a Grade II listed West End theatre, on Shaftesbury Avenue in the City of Westminster. Designed by architect Lewin Sharp for owner Henry Lowenfield, and the fourth legitimate theatre to be constructed on the street, its doors opened on 21 February 1901 with the American musical comedy The Belle of Bohemia. The production was followed by John Martin-Harvey's season, including A Cigarette Maker's Romance and The Only Way, an adaptation of Charles Dickens' A Tale of Two Cities. The first London theatre built in the Edwardian period, the Apollo was renovated by Schaufelberg in 1932, and a private foyer and anteroom was installed to the Royal Box. The sculpted work on the stone fascia is by T. Simpson, the building is of plain brick to the neighbouring streets. The theatre has a first floor central loggia. Inside there is a three galleried auditorium with elaborate plasterwork. The theatre seats 796, and the balcony on the 3rd tier is considered the steepest in London. Step free access is available into the Stalls via Earlham Street and open 30 minutes before the performance. Entrance to the foyer is through two sets of double swing doors. Entrance into the Stalls corridor through the third double EXIT door on Earlham Street. There is a slight slope down into the Stalls. Please speak to a member of the front of house team at the main entrance and they will accompany through to the step free access/seats. Entrance to the theatre is by lift access on Shaftesbury Avenue into the back of the auditorium. There are two wheelchair spaces in G1 and F1 of the Stalls. Wheelchair users can transfer to any end of aisle seat in the Stalls. Venue is not suitable for scooters, but provisions can be made for 1 scooter transfer. Auditorium is carpeted with steep raking. There are 2 wheelchair spaces in row F1 & G1 of the Stalls with companion seats alongside. Wheelchair transfer seats are available to any end of row seat in the Stalls. Access into the auditorium is via an adapted lift access on Shaftesbury Avenue. Toilet Facilities There is an accessible toilet in the Stalls by the level access entrance. The theatre uses the Sennheiser infra-red headset system and 5 headsets are available from the front of house staff in main foyer. These headsets are for people who are hard of hearing but please note there is no induction loop system in the auditorium. There is an induction loop at the Box Office to assist hearing aid users when booking tickets. For further information regarding hearing systems, please call the theatre stage door on 0207 851 2711. The theatre would be grateful for any additional information regarding your needs prior to going to the theatre, especially anything regarding sensory issues or matters relating to Autistic Spectrum Disorder. Please feel welcome to call the theatre management on 0207 851 2711 so they can offer you more assistance throughout your visit. Ticket Prices: ?25.00 - Twelfth Night ?25.00 - Richard III ?25.00 - Curious Incident of the Dog Please note the prices mentioned above are per ticket and only available for the disabled person and companion. Additional tickets are charged at the regular rate.